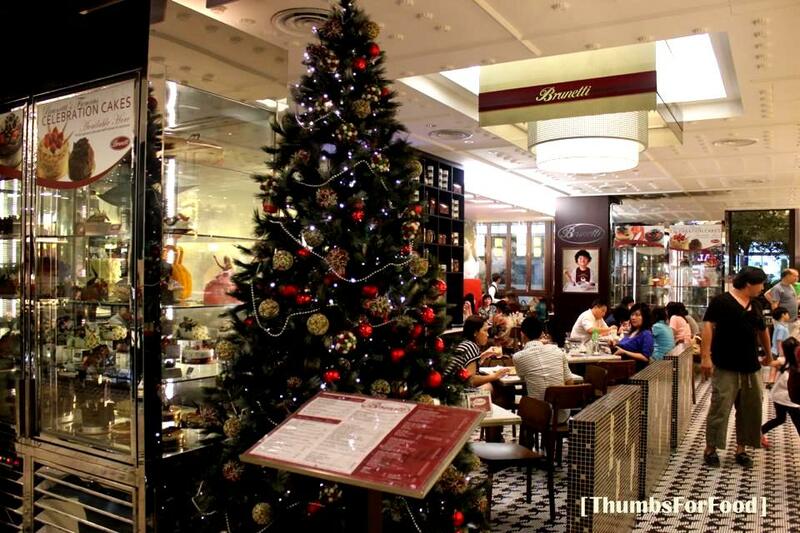 Brunetti originated from Austrailia and is well known for its desserts as well as coffee. It also serves breakfast menu where it's specialty breakfast set is available till 2pm. It also has an all-day breakfast menu as well as an all-day dining menu which serves main courses. 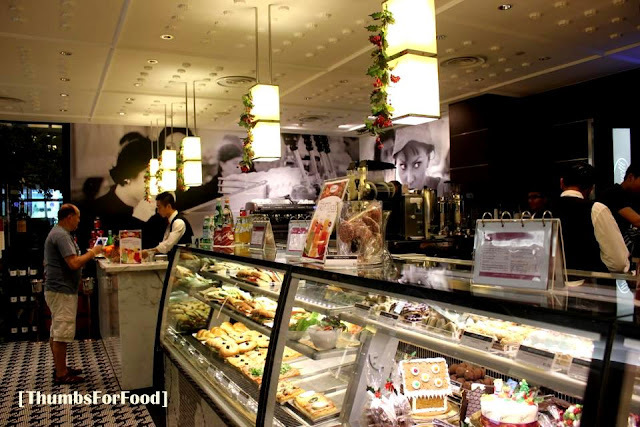 When you step into the restaurant you would be greeted by a cozy ambience with rows of desserts, pies, pastries, gelato lining on the right. 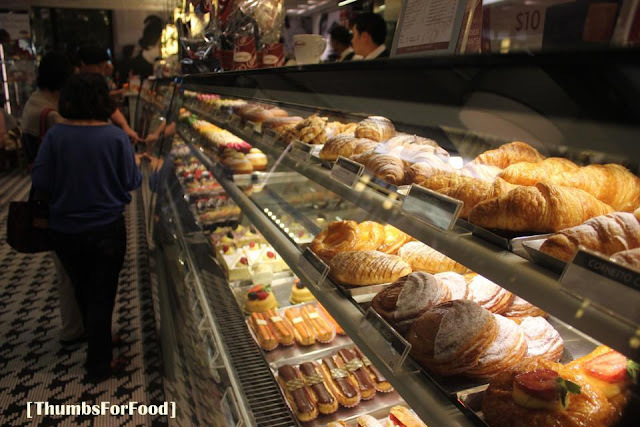 It makes me excited to see the different variety of food placed in glass displays. It just whets the appetite. Your will have to get your own seat in the restaurant and order straight from their counter. We didn't manage to catch the breakfast menu available till 2pm. 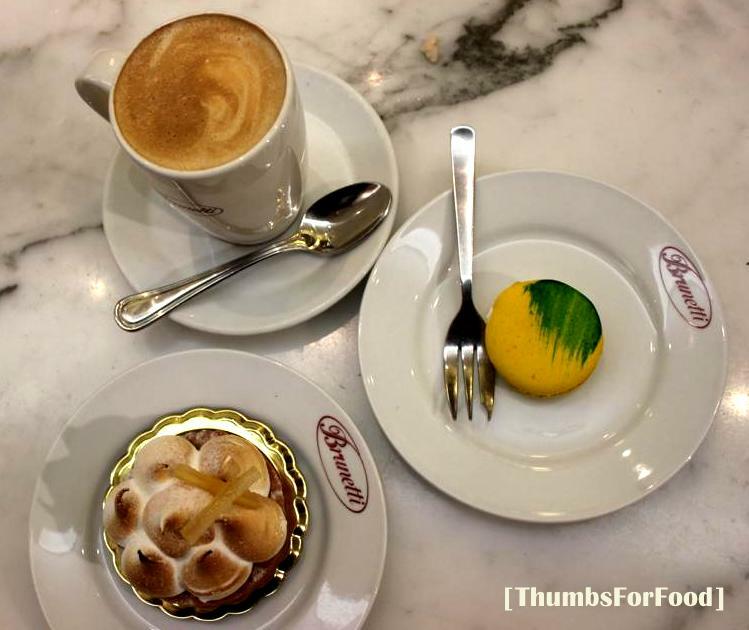 However, if you get to Brunetti's in time for it, do try the Italian Breakfast ($14.90). It is highly recommended by my friend for its generous portion. We decided to order dishes from the all-day breakfast section as well as main courses. 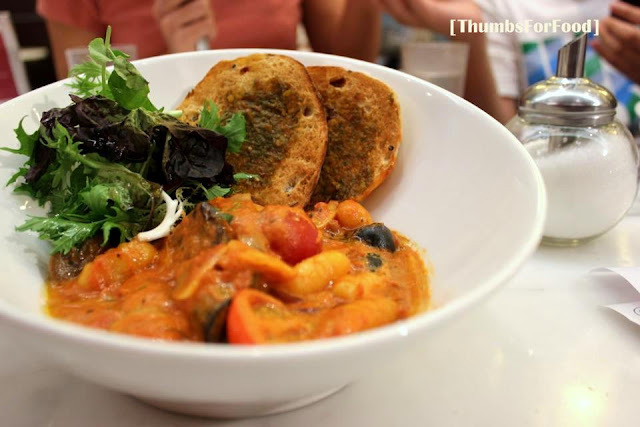 The food is pretty affordable with most prices ranging from $10 to $20+. 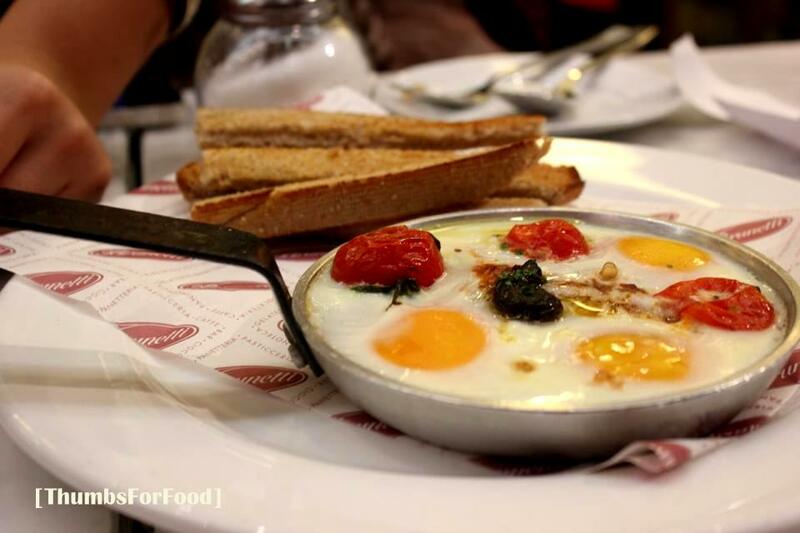 Italian Pan Eggs came literally in a pan. It comes with about 3 eggs and topped with garnish and cherry tomatoes. Bread is served alongside for you to go along with your eggs. Personally, I find the dish quite ordinary. I don't think I would order this dish again because it really isn't very special. 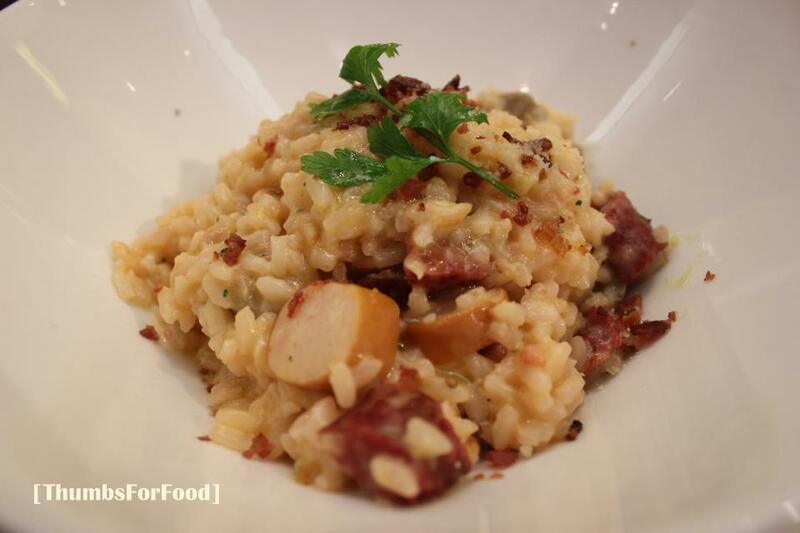 Risotto with Italian Sausages was one of our choices. As Risotto lovers, we wanted to check out where's the best risotto in town. Sad to say, the risotto here wasn't amazing. It has it's own unique flavor and the rice is quite wholesome. The Italian sausages however, was just normal. Nothing exciting about the dish we felt. 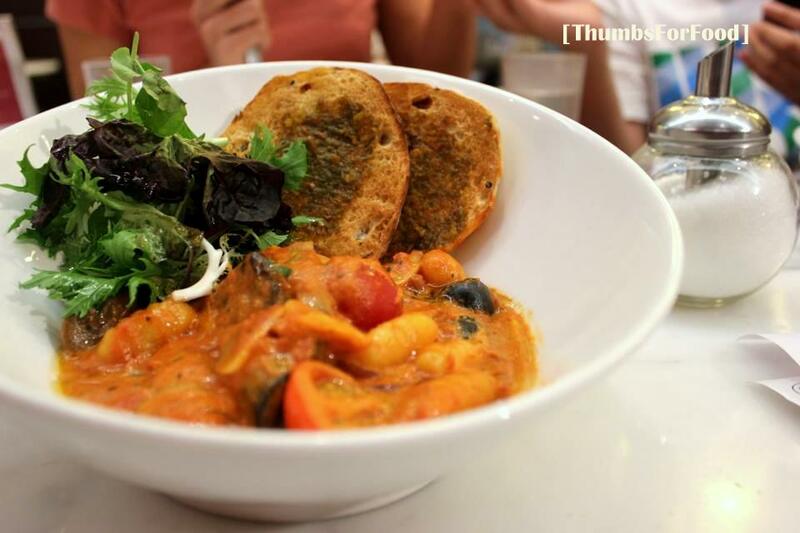 Seafood Stew was one of our favorite dishes that day. It is served with two slices of bread and a handful of greens. The delicious thing was it's flavorful gravy and portion of seafood. The gravy is thick and most suitable to be eaten with bread. There is pasta that is inside the dish as well. I really like the pasta as it was well-cooked and thus have a good texture. Definitely a must-have when we visit this place again. Red Snapper was a recommendation by the waiter. The fish is served beautifully on the p[late which makes it look extremely appealing to the tastebuds. The fish was cooked well and fresh. 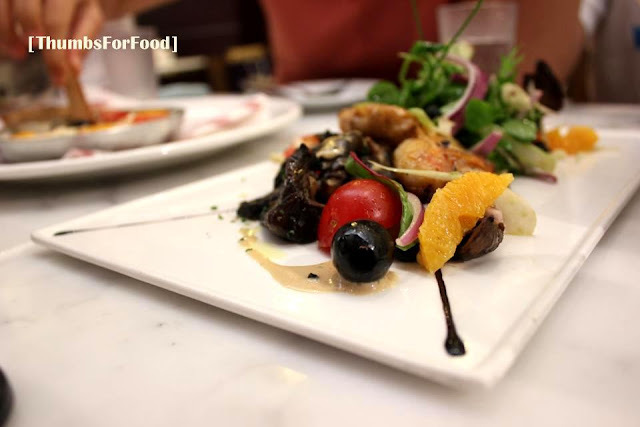 What I really liked was that the fish complemented really well with the mushrooms, slices of fruits, olives and gravy that was served. It is really quite an appetizing and refreshing dish. Truffle fries ($10) wasn't the best we tasted. But, we all agreed that we would order this dish again. The truffle taste was even throughout the fries. 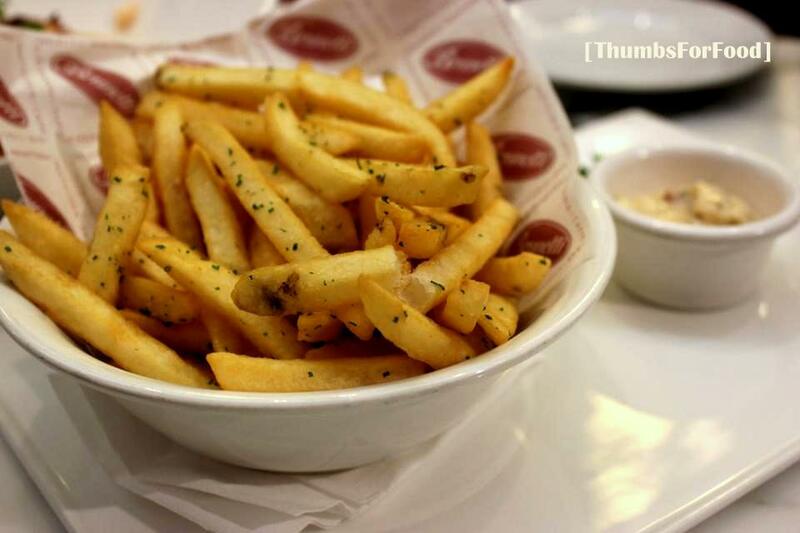 If you're a fan of truffle fries, you'll enjoy the one here. For desserts, we ordered Yuzu Macaron and Lemon Meringue Tart. 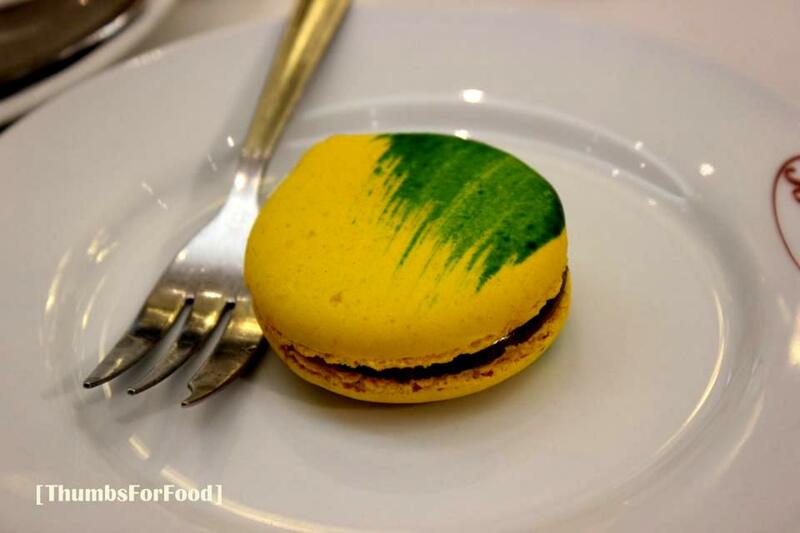 The Yuzu Macaron I felt is quite special and it's yuzu flavor really permeated the shell of the macaron. The filling is chocolate that we felt complemented the yuzu flavor well. The Lemon Meringue Tart was highly recommended in online reviews. So, we had to try it for ourselves. 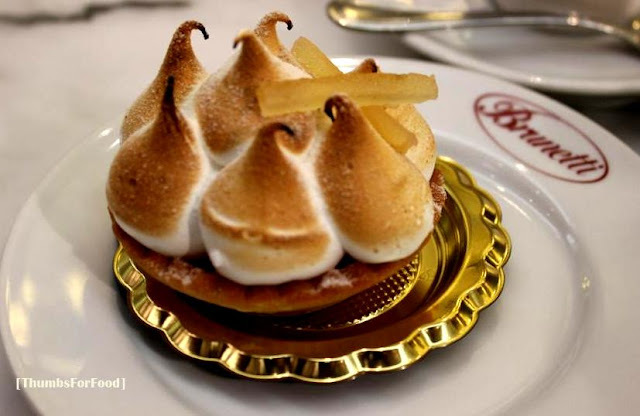 I felt that the lemon feeling in the tart was good and went well with the meringue on top of it. The meringue wasn't too sweet which was good because I am not fan of sweet meringues. Do try the tart if you're there for desserts! We ordered Flat White to go with our desserts. The coffee there is brewed well. Coffee lovers do not hesitate to order a cuppa to go with your breakfast or brunch! Overall, we would be back for it's brunch before 2pm. The brunch here as quipped from a friend is one of the most affordable, good quality and generous portion. The mains has some hits and misses. 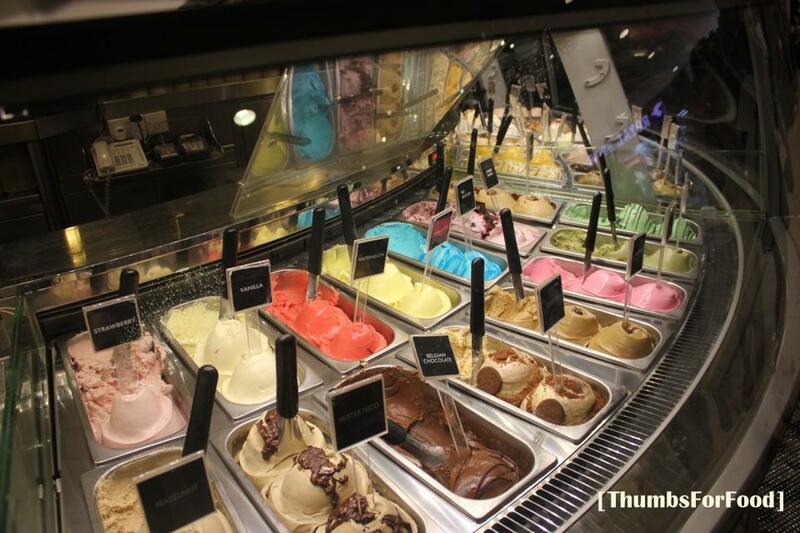 For the desserts, we found it a bit too pricey in relative to it's other dishes. However, if you're a dessert lover, you'll sure be spoilt for choice in Brunetti. 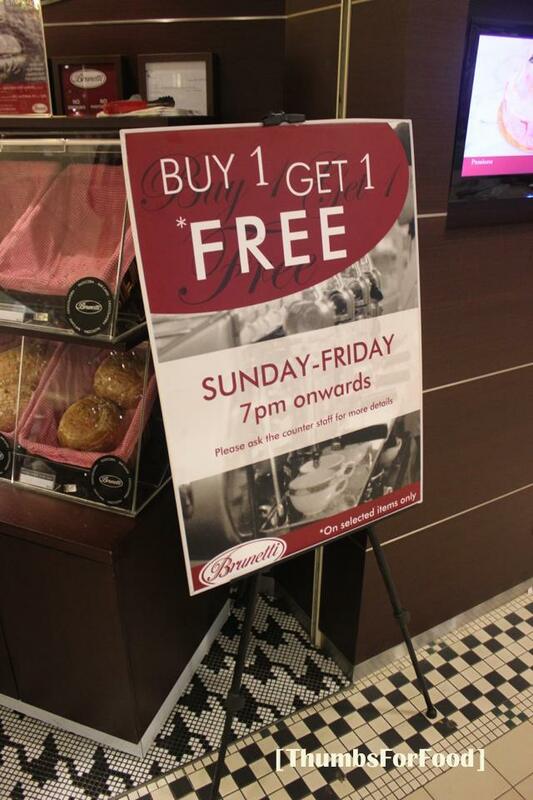 Lastly, they have a 1-for-1 promotion after 7pm from Sunday-Friday on selected desserts, pastries and stuff. So, if you're in the area, no harm swinging by to see what's on sale! Lastly, here's wishing you a Happy Holidays! :) Hope everyone is doing well and please continue to support our blog by checking up on our new posts, Facebook, instagram and twitter!